He is a beauty. Such a good picture too ,Terra. Isn't that perfect , a lovely photo TT , he looks as if he's found a spot of sunshine ! Wow, that is gorgeous Tt! What a little beauty! Its better than some christmas cards Terra! ... and not yet asked for an appearance fee ! Lol. Hello Clarice .. Thank you. superb pic, how close were you? Gone into my faves TT. 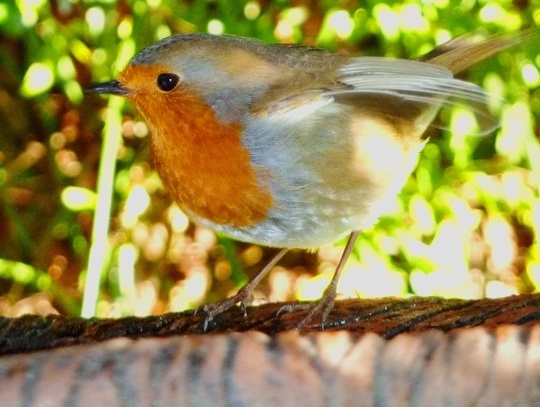 he is a beautiful robin. My younger son has just visited the USA where he saw the robins were much larger birds with blue and red plummage.Not as cute as ours! Hi Julia ... yes the American robins are larger aren't they ... very different to the smaller robins in the UK. Just perfect TT our favourite garden bird a wonderful companion in the garden . I love seeing the robin hopping around. That is amazing Terra !! Many thanks. Lovely to see you on GoY again. I know how very busy you are these days. I'm pleased this is now on your favourites. He's so cute, caught him just right. Thank you Jackie, Avis and Shirl ..
ah, I think it's only other robins that they object to, espeically other male robins! The robin has been visiting all winter ..
... posing for the camera ! oh, you take such lovely photos! I took over 100 pics of a squirrel yesterday, and most were blurred beyond usefulness. I see them on the computer screen. taht's encouraging! doesn't help that I can't see exactly what I'm taking a pic off unless I get so close that I scare it off. I've got a monocular, so I was sighting with that, putting it down and aiming the camera - by which time the object has moved. ah well. adds to the fun. otherwise I wouldn't know where to look ! I've just been searching for your squirrel photo. Have you uploaded one today ? still trying to find a few that aren't blurred out of recognition! lol Terra, I think someone rings a bell and calls "dinner's up!"